Raccoons, what can we say about them, they are what keeps us busy. At one time or another, just about everyone has had a raccoon in their yard. Raccoons are the most widespread of the animals that we get calls for. They are the one animal that really seems to have no "normal" behavior. What do we mean by not normal? They really have so many personalities, shy, bold, curious, cautious, quick to get into trouble, some want to avoid trouble. They really run the whole board of actions. Some are easy to catch, and others are down right impossible. They also have the reputation for doing some of the worst damage to houses. Once they find a way in, they start to set up home quickly. Sometimes it's only mama with her little ones. Other times you may have several generations living in one space, maybe an attic or a barn. We have seen 23 raccoons living in one barn. 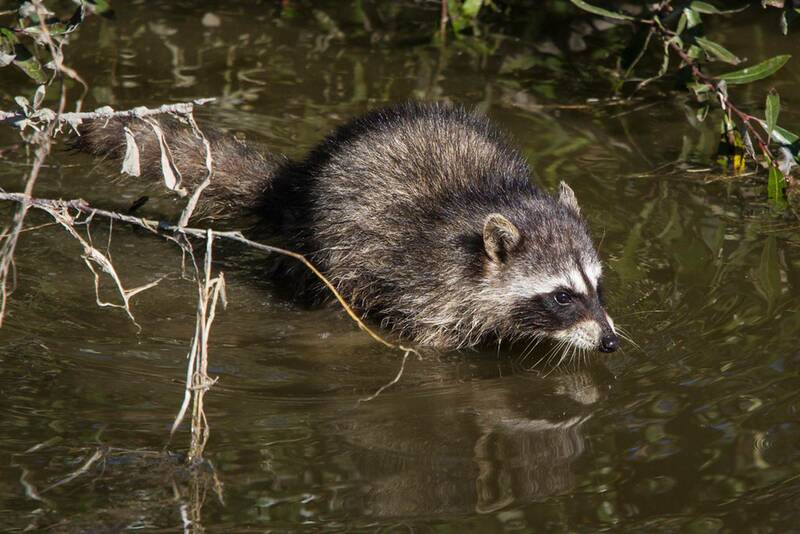 Because raccoons are very adaptable as well as agile, they will find and exploit any food source and shelter. Every raccoon removal project can be different, especially if the raccoon (s) have been allowed to stay for a long period of time. Early removal is best and prevents more damage from occurring. We can take a look at your project and come up with a solution to remove current raccoons and help you find ways to make your yard and house less attractive to future problems. Raccoon removal is one of our most frequent projects. Raccoons, beaver and squirrels are our specialties.